Jocelyn Slaughter, Executive Director, Greenville Literacy Association Jocelyn Slaughter has served as Executive Director of Greenville Literacy Association since April 2016. In that role, she is responsible for strategic planning, human resources, operations, and fundraising. Natoshia D. Mayer, President, Nehemiah Community Revitalization Corporation Natoshia earned a GED in 1991 from the Sullivan Center. Now serving as President, Natoshia is completing 20 years with Nehemiah Community Revitalization Corporation, an interfaith non-profit housing and economic development corporation operating across South Carolina. 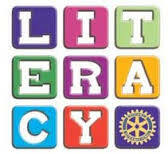 Natoshia is a member of the Rotary Club of Greater Greer which is a partner in the Rotary Partnership for Literacy. Antonio Durham, GED student at Greenville Literacy Association Antonio is a Greenville native who dropped out of high school in the 10th grade. With experience at JobCorp and in manufacturing and sanitation, he came to GLA in 2011 with the dream of obtaining his GED. Antonio’s GED testing pursuits have been supported by the Rotary Partnership for Literacy. Liliana Marin, English as a Second Language student at the Greenville Literacy Association Liliana is from Bogota, Colombia. Formerly a Systems Engineer, Liliana arrived in the United States a little over a year ago. She quickly enrolled in GLA’s English classes in the hope of seamlessly acclimating to American life. Her recent successes include earning a Silver WorkKeys certificate and completing the Employment Readiness course as well as earning a promotion from the Level 5/6 ESL class to the Level 6/7 Career Pathways class, which is located in GLA’s new Rotary Career Readiness Learning Center.